I had 2 absolute EPIC days of powder skiing over closing weekend at Revelstoke Mountain Resort. Revelstoke boasts the highest vertical in North America at 1713 meter or 5620 feet! I had 2 absolute EPIC days of powder skiing over closing weekend at Revelstoke Mountain Resort. Revelstoke boasts the highest vertical in North America at 1713 meter or 5620 feet! But I almost didn’t get to ski Revelstoke Mountain Resort this holiday. As the end of the season approached I wanted to take a road trip west to check out some more BC ski resorts. After I’ve finished the CSIA Level 2 course in Fernie, many of the other resorts were already closed. Some friends that we met on the Nonstop course wanted to head to Whistler, so I decided to join them. Whistler is about a 12 hour drive from Fernie so we started to search for a resort about half way that was still open. Lucky for us, Revelstoke Mountain Resort was closing that weekend and was almost exactly half way to Whistler. So with an early start on the Saturday morning, and with the bonus of an hour time change as we change to Pacific Time, we were on the gondola short after opening. The drive through Rogers Pass was spectacular. 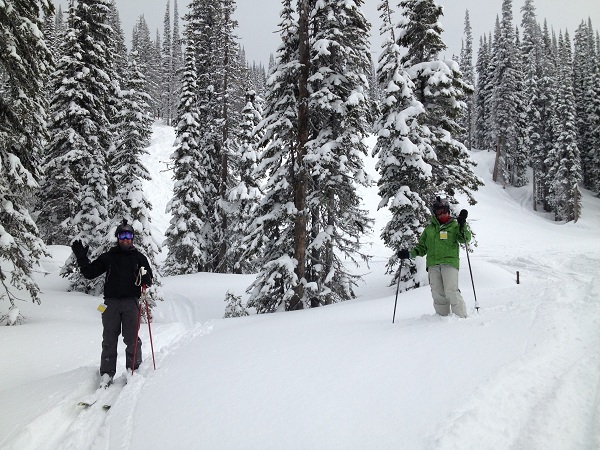 Graig, Kayti and I had sooo much fun in fresh powder at Revelstoke Mountain Resort! The relatively hot weather during the early days of April necessitated the closure of the lower part of the mountain, so that meant that we would not be able to ski the 1713 meters in vertical. But we did not care; there was about 20-30 cm of fresh powder and heaps of tree runs to play on. Revelstoke Mountain Resort is only about 6 years old, so the infrastructure is brand new, the lifts are quick and everything was in perfect condition. It looks like they have big plans to expand the resort and try and compete with Whistler in the long run. They are planning more than 20 more lifts and heaps more skiable area. We got an end of season special at The Sutton Place Hotel at the bottom of the hill, which was world class. The rooms were modern, fully equipped condo units, with washing machines and driers. We did not have time to try out the heated pool or gym, but they looked superb. They are aggressively marketing the real estate opportunity, selling Revelstoke as a four season’s mountain resort. Since the lower part of the mountain was closed, there was not many beginner runs open. The upper mountain offers a great mix of double blacks, blacks and blue runs. There are countless glade runs, and the lifts are so fast you can get some big mileage. We had some great fun in the North Bowl, I even found myself in a deep tree well. Luckily I got out pretty easy. Revelstoke Mountain Resort also offers Cat and Heli skiing from the resort. One nice thing about starting the cat skiing from the resort is that you can gain 2225 meter in elevation before your day starts by taking the resort lifts. They also have Ski touring from the resort and there is a tube park next to the bottom beginner area. Apparently, Revelstoke Mountain Resort’s opening in 2007 was the biggest ski resort opening in North America in 20 years. Unfortunately a ski instructor from Edmonton fell in a tree well over opening weekend that December, and was found dead a few days later. Everything I saw at Revelstoke Mountain Resort showed that they have very big ambitions, and they are doing a great job. I am keen to see how it develops over the next 20 years or so. It will be interesting to see if they can make the airport work and appeal to the Calgary and Vancouver markets better that way. If you ever find yourself close by make sure you visit Revelstoke Mountain Resort. This entry was posted in Ski Resorts, Sports on 2013/05/09 by Justinus.